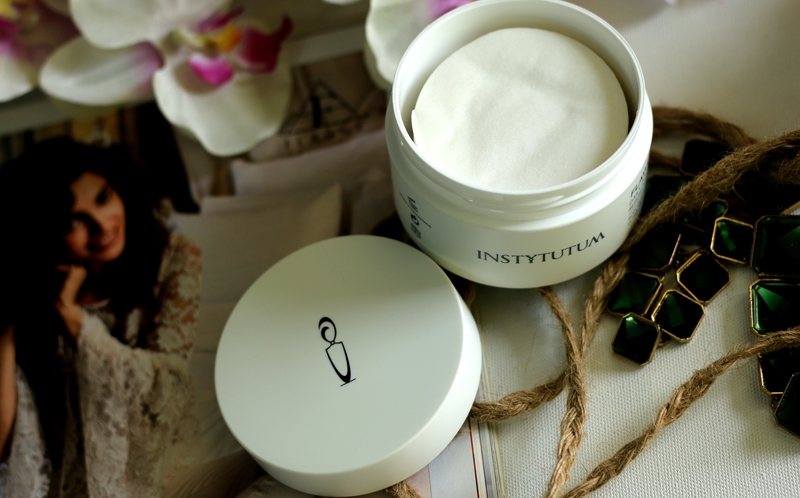 INSTYTUTUM is a Swiss skincare brand with high standards and quality products that aim to create FLAWLESS SKIN. 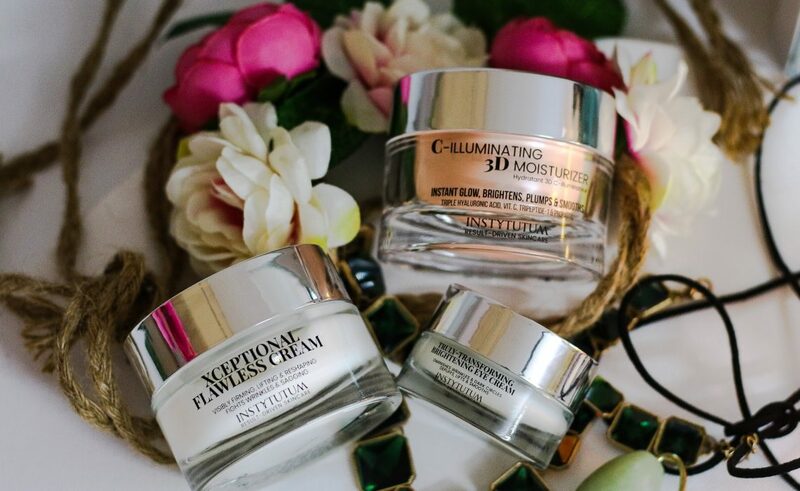 The innovative superpacked formulas combine efficacious levels of the most powerful groundbreaking anti-aging, and cosmeceutical ingredients that the skin needs to address all skin concerns. If you are a regular reader of my blog – You girls might already know my love for the brand INSTYTUTUM and their result oriented skincare products. All of the products have been clinically tested to ensure scientifically-proven efficacy. Each formula contains efficacious levels of the most important ingredients your skin needs. You can read about their products and how I used each of them by checking out this post from last year. 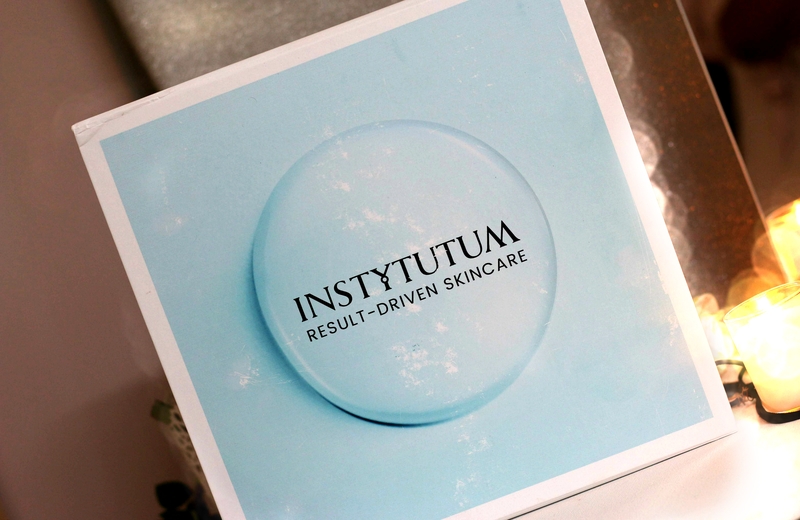 INSTYTUTUM SKINCARE RANGE – The new look! 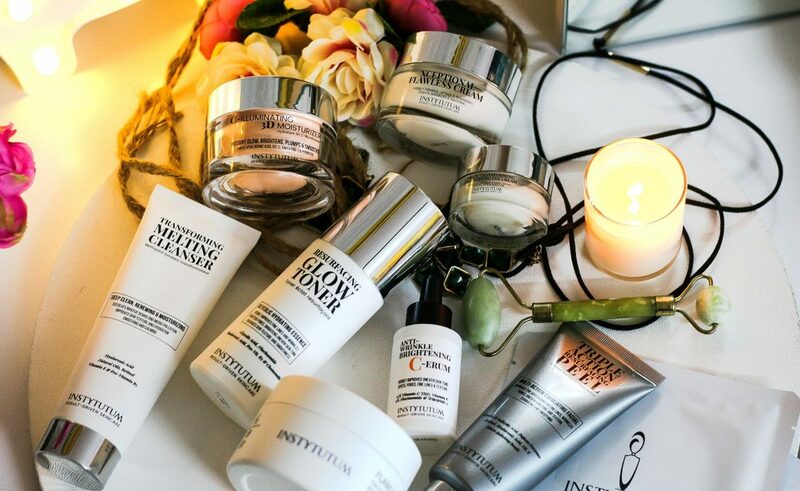 INSTYTUTUM High Performance Skincare was founded by Natalia Derkach, M.D., a truly visionary woman. 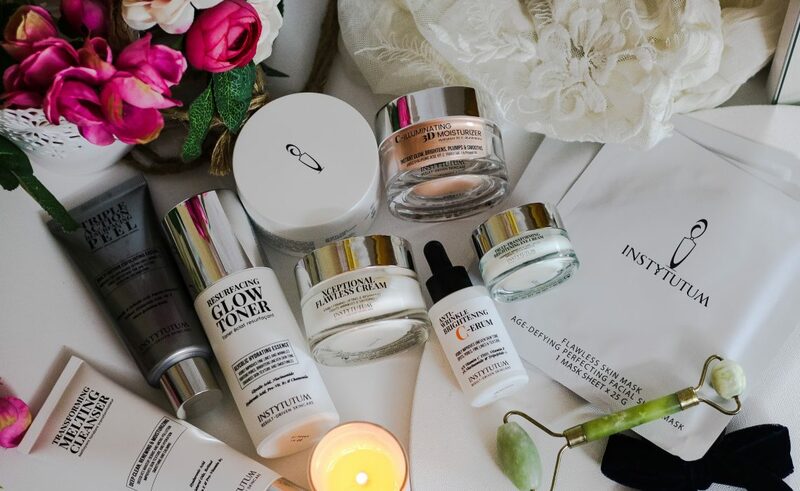 Her dream was to create her own skincare brand with truly effective, innovative, clinically-tested products.To pursue her passion for beauty, she teamed up with the most prestigious Swiss laboratory. Its scientists have over 30 years of experience in the skincare industry. 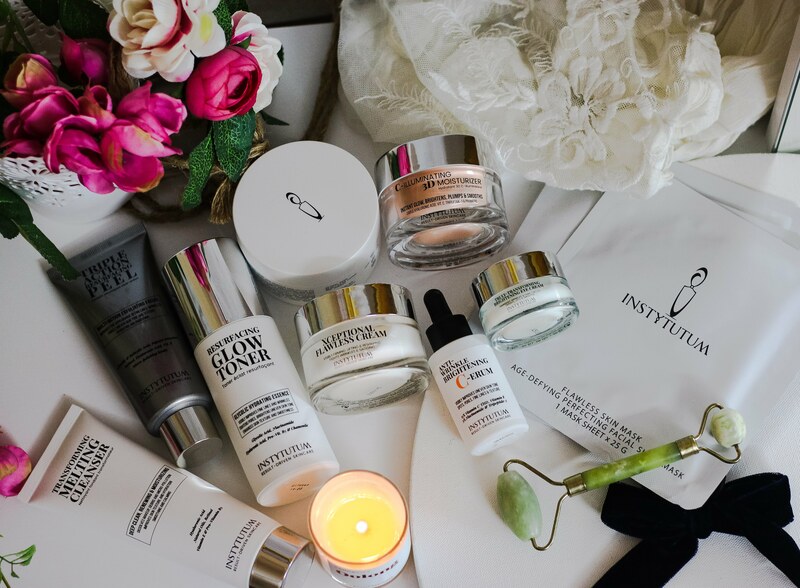 Together they created INSTYTUTUM skincare and brought her vision to life. If you check out the image above – You will notice that there is a change in the packaging. 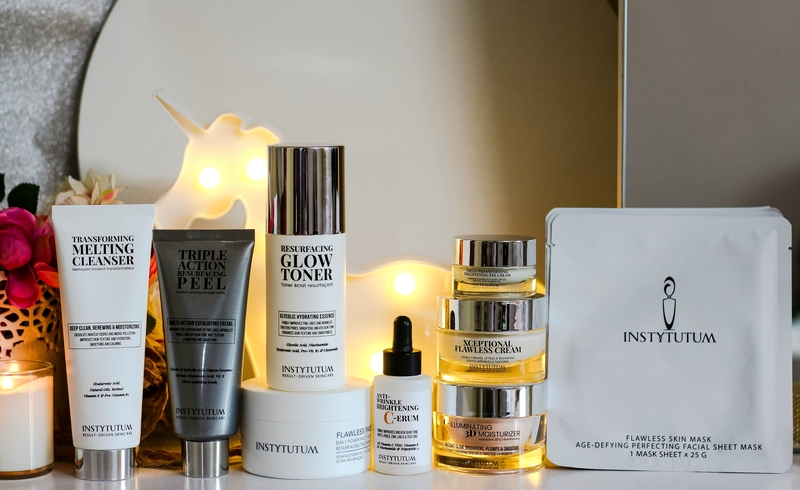 Yes, The brand have reformulated the products and have introduced a new and improved packaging for their entire skincare line. In this post, I will be introducing you girls their wonderful range of products and I am going to tell you – How to use each of their products. I’m excited to let you all know my initial impressions on these new product formulas and also share a non-affiliate code to save 20% on your order! Love the look of this huge box all my products came in! Wearing makeup is one of my most enjoyable part everyday. But, at the end of the day, Removing it is quite challenging. Especially, after a hectic day at work where you just want to crash on the bed. 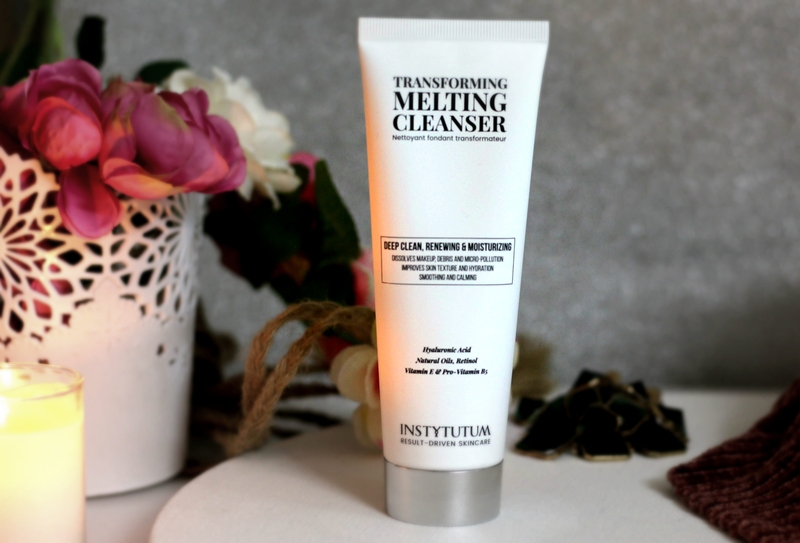 Instytutum’s unique transforming cleanser leaves the skin beautifully cleansed, hydrated and supple. Visibly replenishing and smoothing while renewing the complexion at the same time. The skin feels soft, hydrated, and radiant looking. 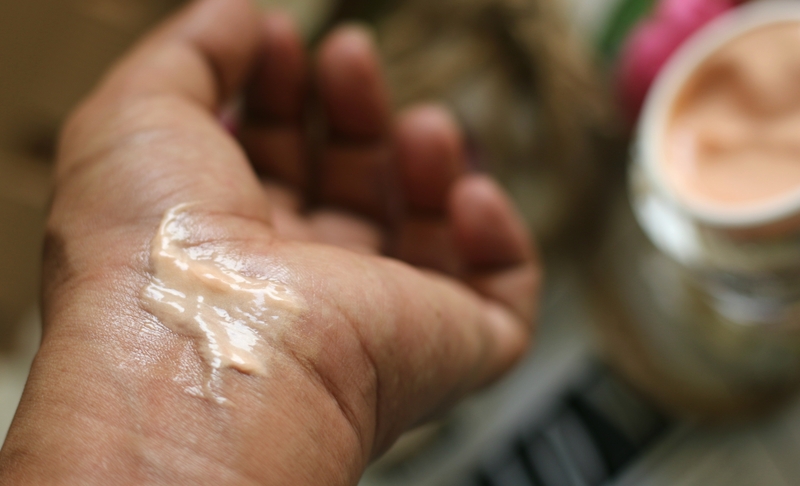 All you need to do is — apply this on your dry skin, You needn’t moisten skin beforehand. Instead, Just massage in. 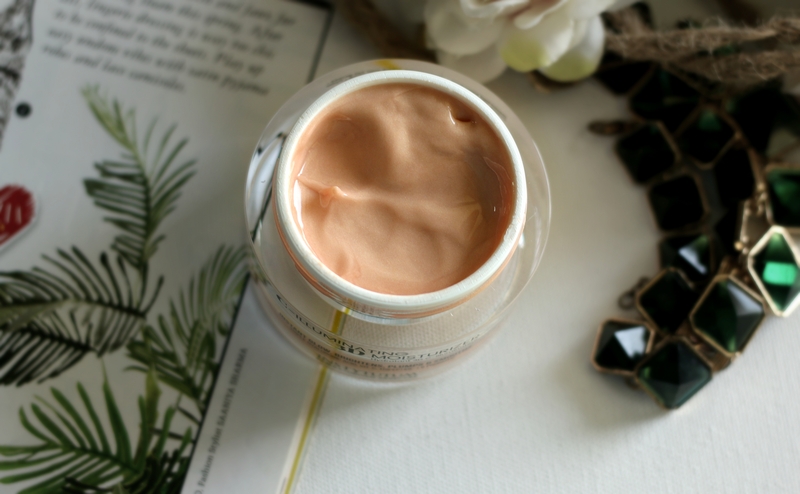 Once the product is spread all over your face, Moisten the skin to transform the balm into a silky emulsion. 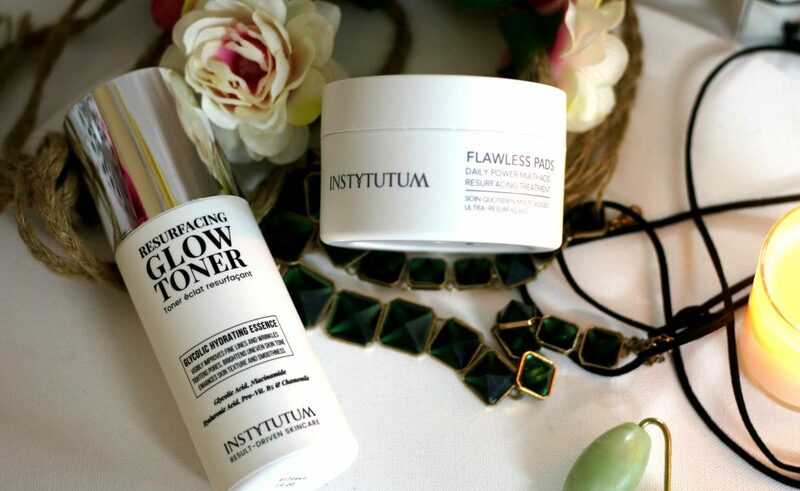 Rinse off thoroughly with lukewarm water and follow with Resurfacing Glow Toner or Flawless Pads. 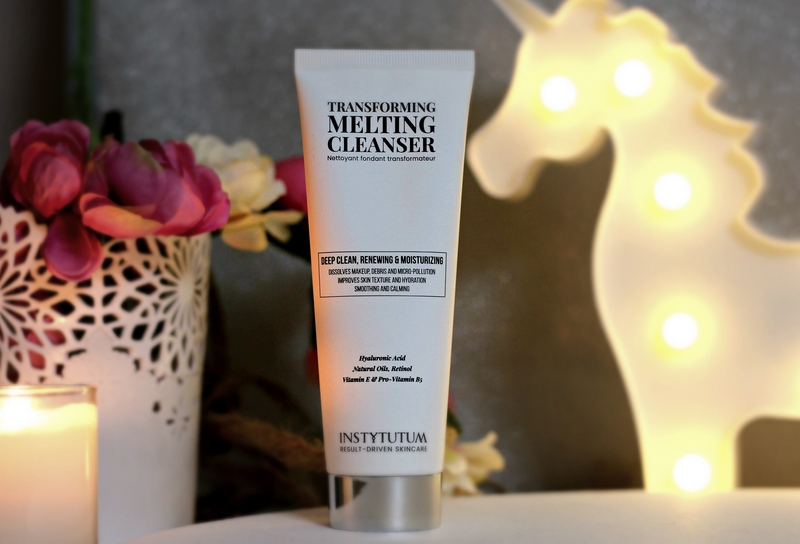 What I really love about this Melting Cleanser is that it’s deep cleansing on skin and post wash you don’t feel your skin has become dry or anything like that. You get 4.1 OZ/120 ML of product for $ 45.00. The tube packaging makes it easy to use as well. This transforming, rich balm melts into a light weight oil. Upon contact with water, it turns into a silky emulsion and instantly dissolves and removes makeup and impurities, clean your pores etc. Skin feels thoroughly cleansed, soft and radiant-looking. It also has the renewal benefits of Retinol to refine skin texture, Hyaluronic Acid to improve moisture and elasticity, Vitamin E, Provitamin B5 and Allantoin to calm, soothe and strengthen barrier function. Overall, its a daily usable makeup cleanser that takes away all impurities and makeup off your face without leaving your face over dry etc. It also doesn’t strip natural oils off your face. Upon contact with water it transforms from a balm to an oil into a silky emulsion. Skin feels plumped and hydrated post wash. If you are wearing heavy duty makeup, I recommend you use this as a second cleanser to make sure all impurities are off your face. Note – As it has Retinol, Be careful about using it if you are pregnant. 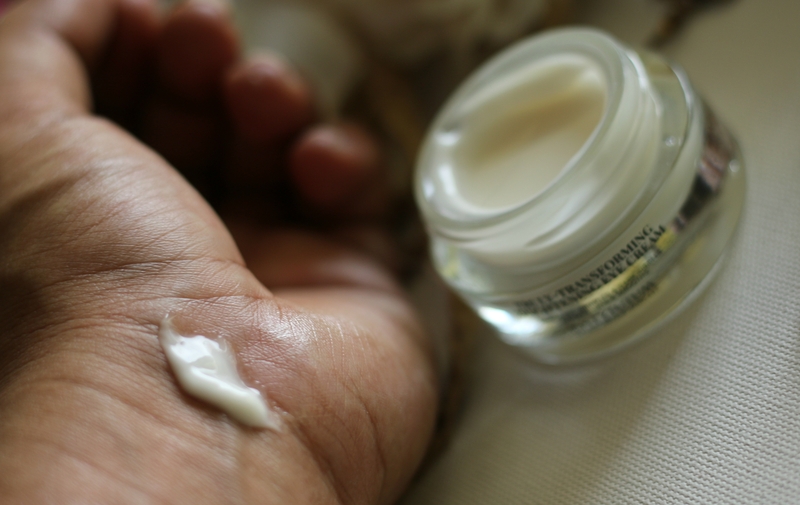 Consult with your doctor before you use products that contain Retinol as an ingredient. Acid Toning is not something new to me. My skin is used to glycolic acid toners. Post washing and makeup removal, This is the last step of cleansing and at the same time the essence in toner. The skin is not only refined but already deeply hydrated, plump and calm. 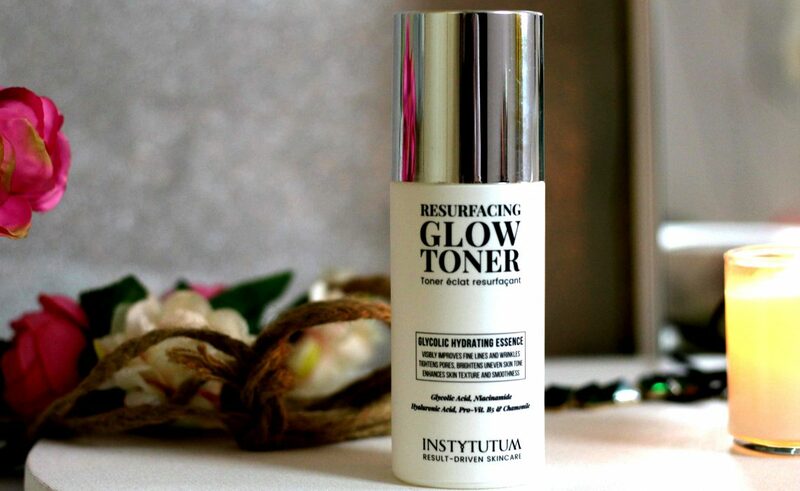 Instytutum Resurfacing Glow Toner has a perfect pH level of 3,5 to ensure real efficacy. 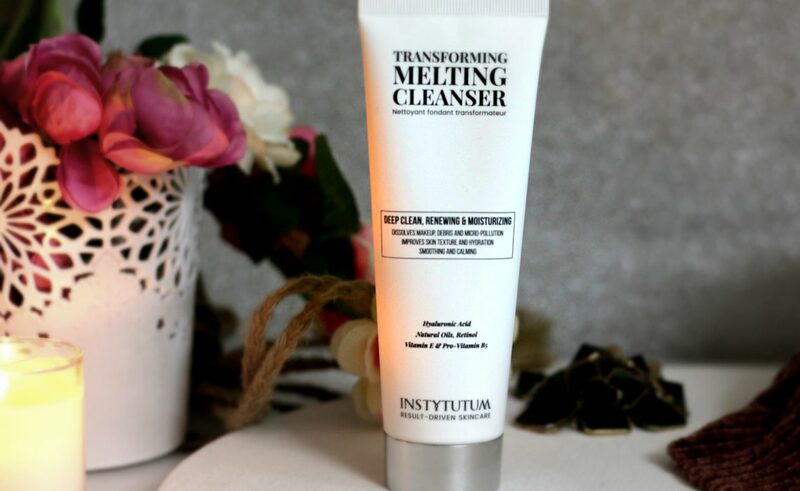 Instytutum’s Resurfacing Glow Toner / Glycolic Hydrating Essence is formulated with 6% Glycolic Acid and 2% Niacinamide to gently exfoliate the skin’s surface to visibly improve the look of fine lines, wrinkles, pores, uneven skin tone etc. Thereby, helps brighten, clarify and smooth the complexion. It also effectively reduces sebum production and impurities. Allantoin, Chamomile and Pro-Vitamin B5 help soothe and calm the skin while Hyaluronic Acid leaves the skin plump and hydrated. Use after cleansing or after a peel. Pour a little quantity onto a cotton pad or on your hands and apply to the face, neck and décolleté. 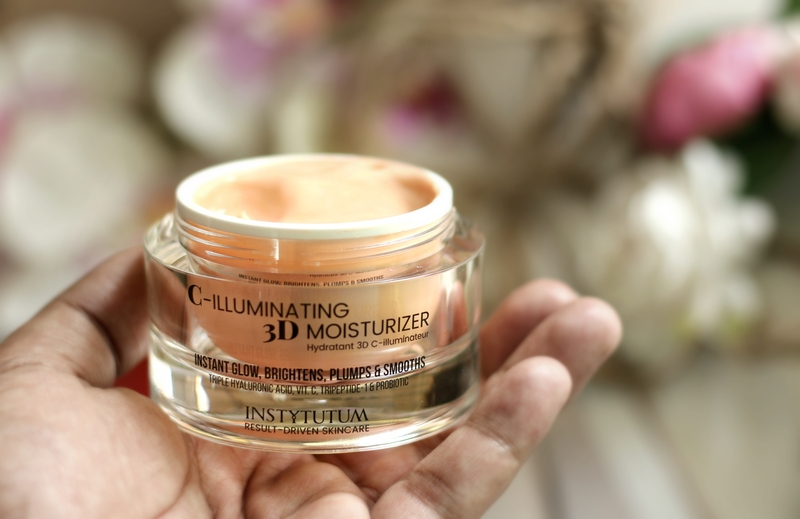 Leave on for about 10 seconds, then apply your regular moisturizer(day/night). I love the fact that it’s non sticky and I can layer my skincare products on top. Skin feels very refreshed. Who can use Toners – Toners are necessary for people with oily or acne-prone skin and essential for those like me who really look forward to that extra cleansing step post makeup removal and usage of other heavy skincare products like sunscreen etc. I will talk about the Flawless Pads next. 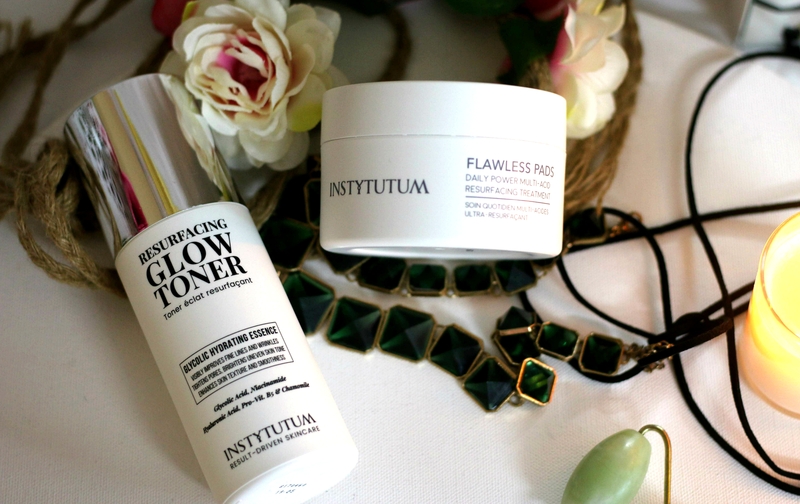 Post Cleansing – You only need either of these — glow toner or the flawless pads. 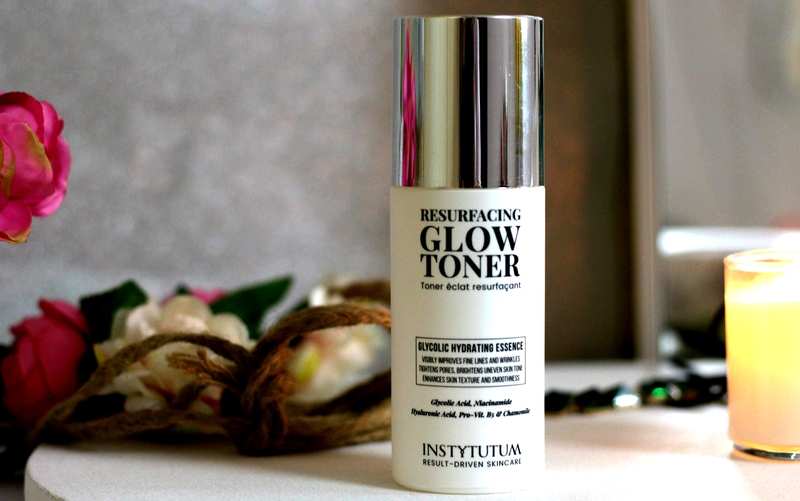 Glow Toner by Instytutum is gentle and soothing on skin and it helps unclog pores by removing excess oil and traces of dirt etc. Toner has a perfect pH level of 3,5 to ensure the maximum efficacy. 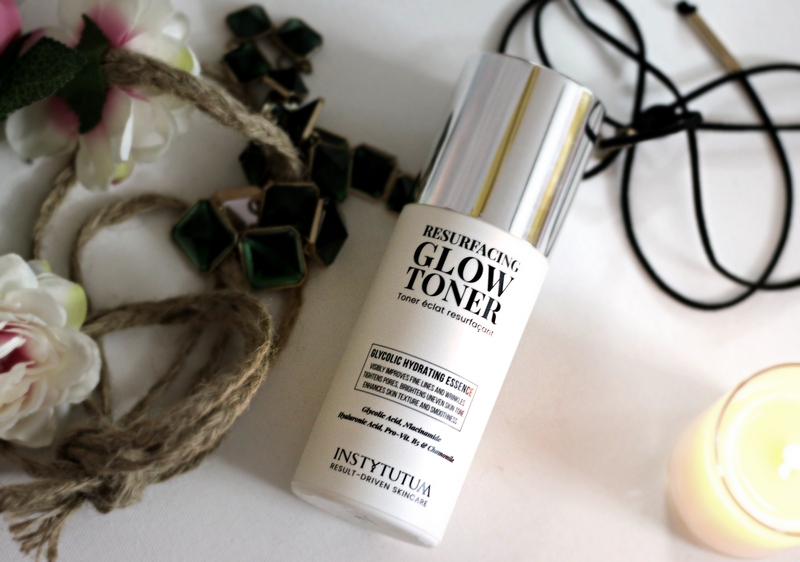 Also, Instytutum Resurfacing Glow Toner is formulated with 6% Glycolic Acid and 2% Niacinamide to gently exfoliate the skin’s surface to visibly improve the texture of skin. 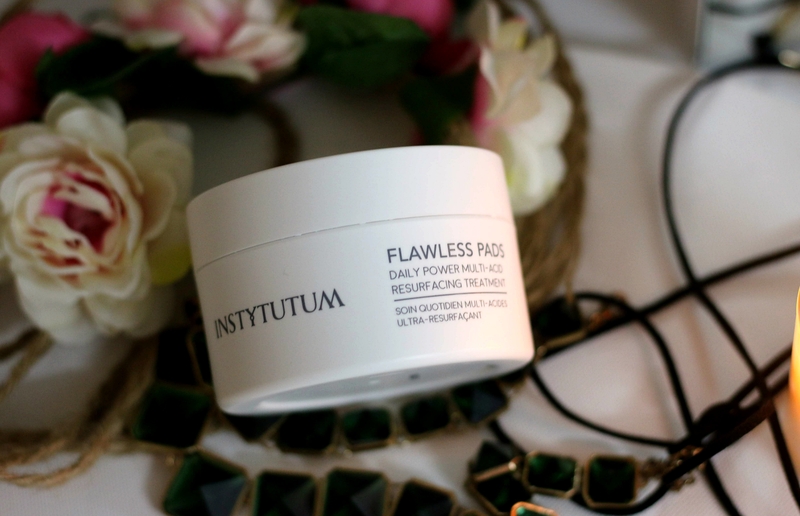 Instytutum Resurfacing Treatment Flawless Pads are super easy to use. They are pre-soaked facial pads that are formulated with glycolic, lactic, citric, hyaluronic and salicylic acids, plus Pro-Vitamin B5 and Niacinamide. Regular use of this acid toning pads helps reduce pore size, fine lines, and wrinkles and improve skin tone, texture and luminosity. 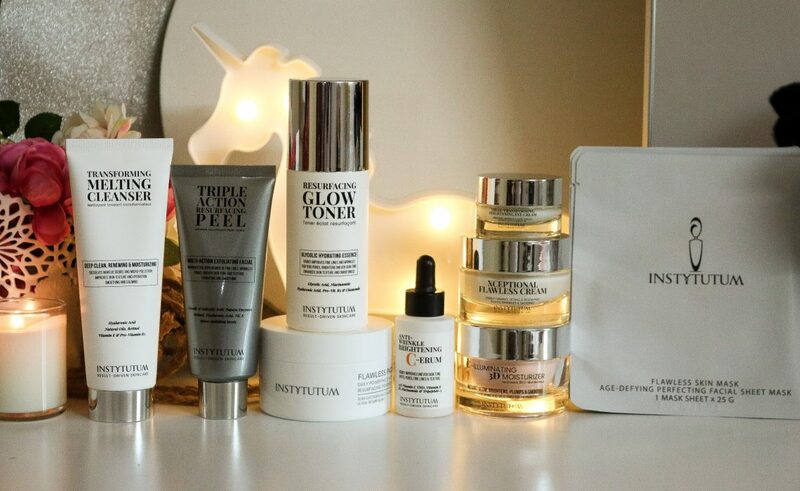 They also promote collagen production and cell turnover, whilst improving hyperpigmentation and boosting moisture. Helps resurface and retexturize the skin surface. Take a pad and wipe over clean, dry skin on face and neck, avoiding the area around the eyes. Recommended usage initially is upto 3 times a week and then building up to twice daily depending on skin tolerance. Overall, am very impressed with these acid toning pads. Especially, they are so convenient and easy to use. My skin started to look more clearer and radiant with less breakouts ever since I started using these. There is no skin irritation or breakouts etc. Love the fact that it gently exfoliate the skin and ingredient list is amazing too — glycolic, lactic, citric, and salicylic acid. Overall plumpness and facial moisture balance is maintained by ingredients — hyaluronic acid and Vitamin B3. 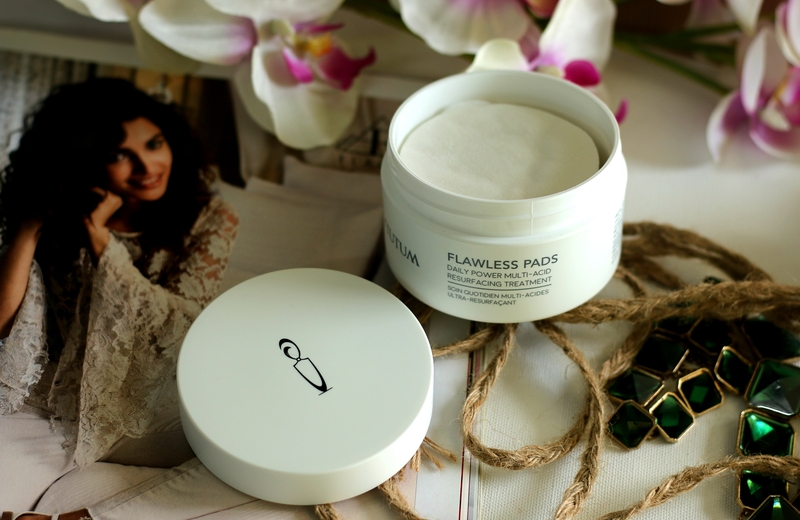 The pads are gentle and effective on my skin and I prefer to use it at night. when I wake up the next morning, my skin feels soft, radiant. Skin texture appears more firmer as well. 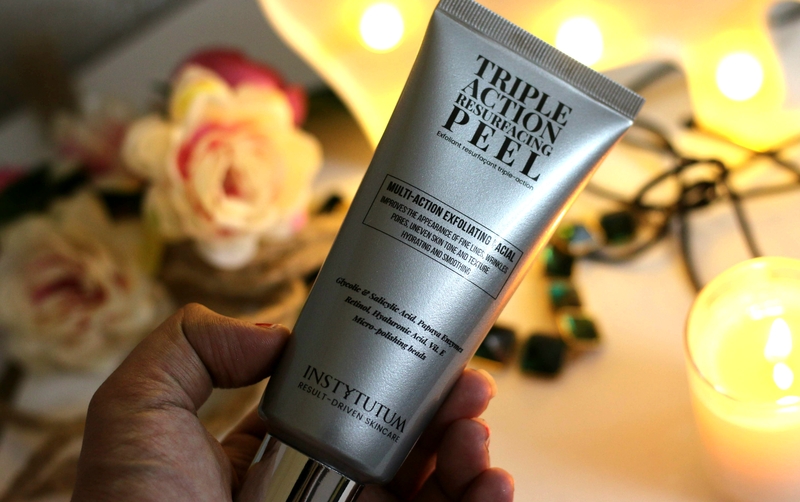 Instytutum Triple-Action Resurfacing Peel contains a 10% acid duo, papaya enzymes and loads of ultrafine micro-polishing beads for an @home microdermabrasion treatment effect. With its powerful complex of salicylic acid, papaya enzymes and micro-polishing particles, the active formulation exfoliates and resurfaces, correcting skin imperfections and instantly improving texture and tone for smoother radiant, regenerated and brighter looking skin. Renewing Retinol, Hyaluronic Acid, Pro-Vitamin B5 and Vitamin E moisturize, soothe and regenerate the skin. Visibly reduces fine lines, wrinkles and pores, whilst improving the appearance of discoloration and dark spots for a brighter, smoother and renewed complexion. Apply an even layer to the face, neck and décolleté, avoiding the eye area, massaging in circular motions for 1-3 minutes. Leave on for 5-8 minutes for best results. Rinse thoroughly with lukewarm water. 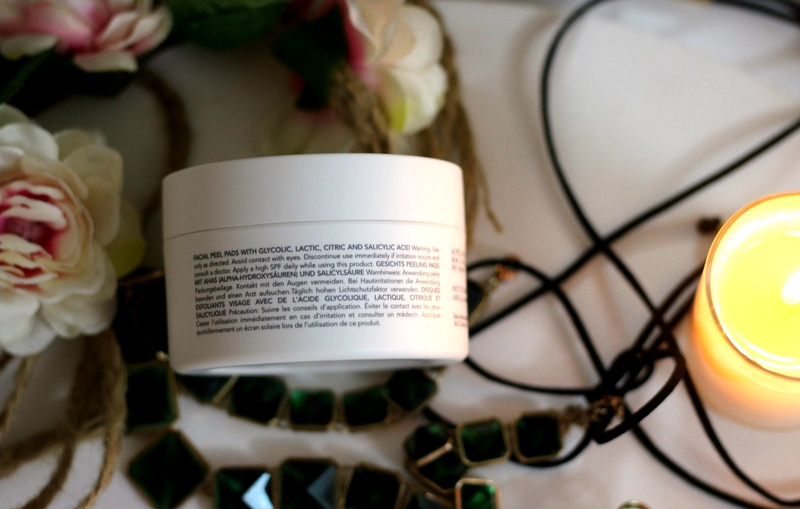 For sensitive skin, use as a mask without polishing, leave on for 3-5 minutes. For best results use this peel 1-2 times a week, followed by Serum and Cream. 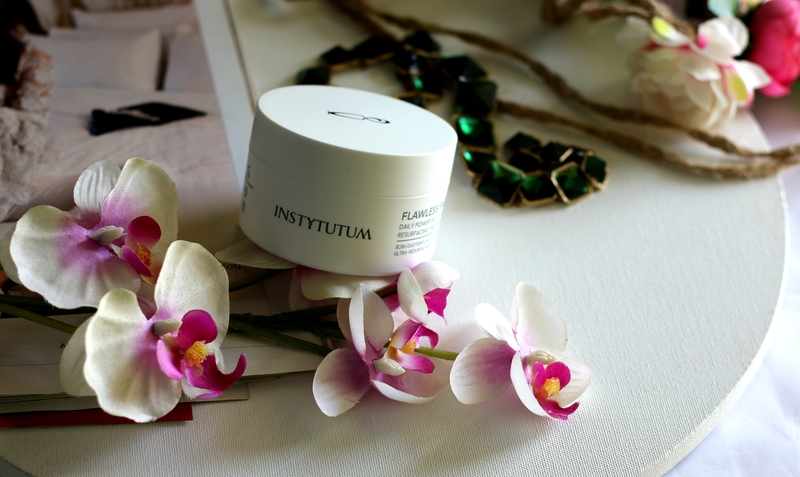 Instytutum Triple-Action Resurfacing Peel is very gentle and non-abrasive. As you massage it on to your wet skin (I sometimes use hands to massage and sometimes use my Clarisonic/Remington face cleansing brush), the exfoliating particles dissolve into a creamy milk without irritating the skin. I definitely felt my skin was softer after using it, however you get the best results when it’s used in conjunction with the sheet mask. 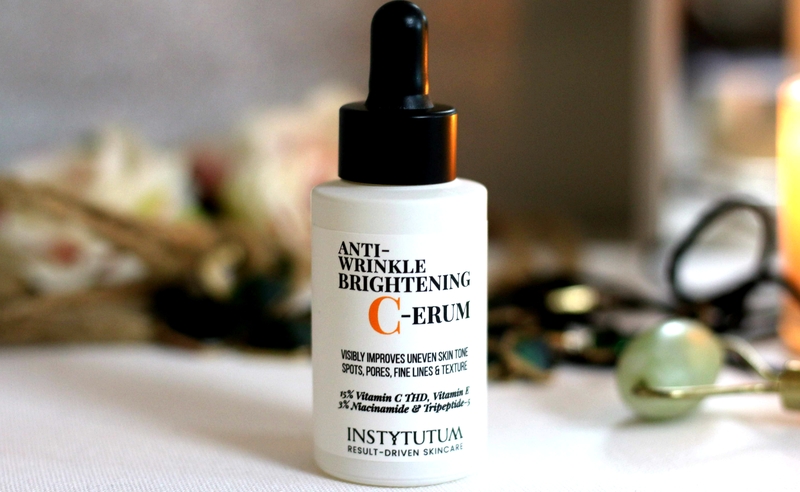 Instytutum Anti-wrinkle Brightening C-erum is a highly potent, serum jam packed with 15% Vitamin C (THD), infused with multiple exceptionally powerful ingredients for real results. Multi-beneficial to improve all major skin concerns at once. 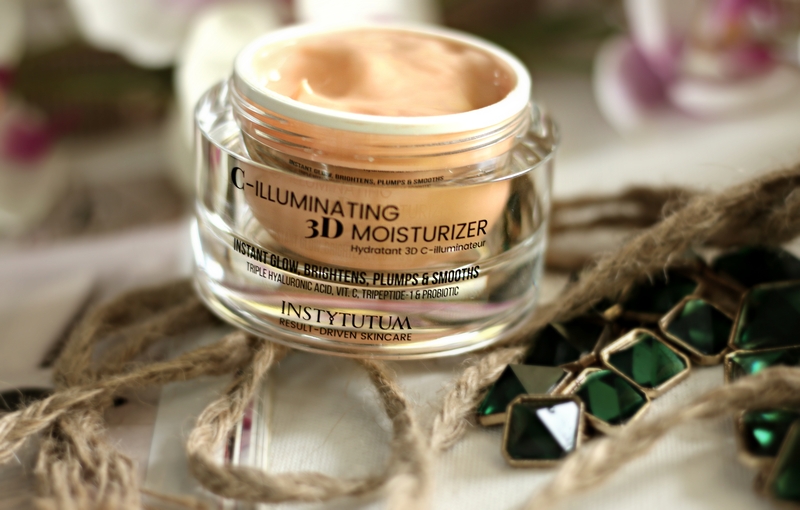 Instantly brightening and a dewy skin smoothing glow. If you are looking for a daily serum that helps get rid of hyper pigmentation or marks/spots left from acne on your face. This is an awesome product to try! 2-3 drops can cover the entire face and neck. Doesn’t feel greasy or sticky to face. Texture is very very lightweight on skin and easily gets absorbed quickly too. I like the pleasant fragrance. I use this after cleansing and Toning during day & night before my day/night cream. I concentrate on areas where I have spots and redness. I didn’t experience any breakouts on my skin which is a wow factor. I am looking forward to continue this to see how it works on a long run. 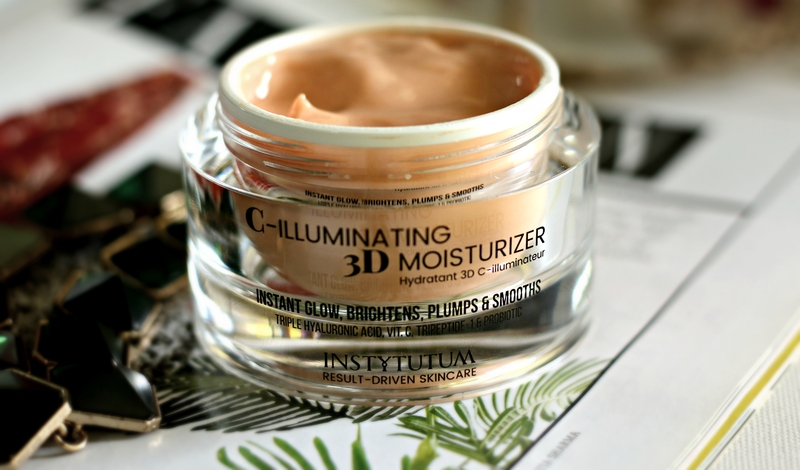 For an illuminating glow and a soft, plumped, healthy and intensely hydrated skin. 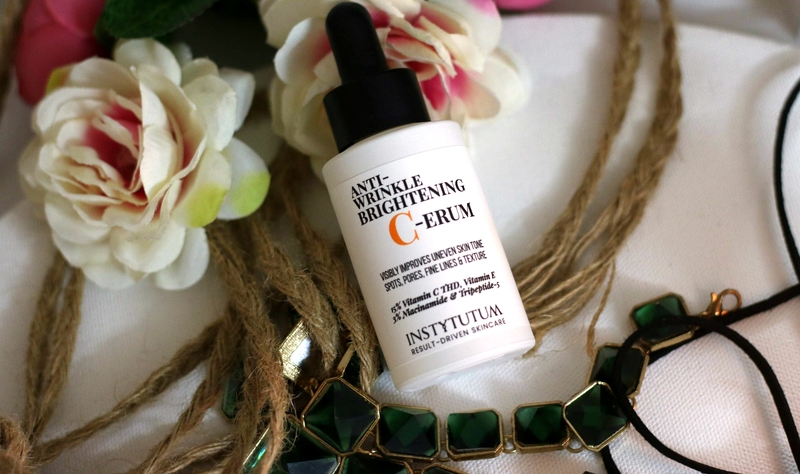 This super-charged anti-aging formula is a real multi-tasker. The texture will blur, enhance and reflect your complexion. Use alone for a natural luminous finish, or enhance your makeup with a pearlescent glow. 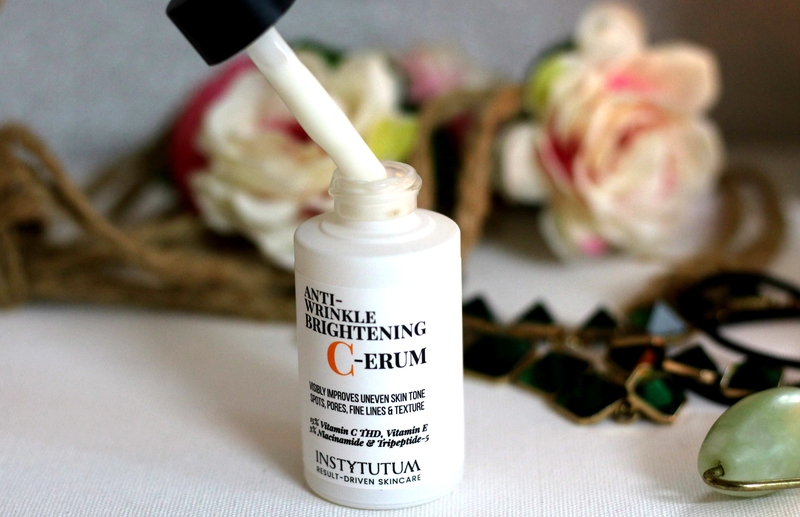 This anti-aging formula combines Vitamin C for brightening, reducing hyperpigmentation stimulating collagen and increased elasticity. The Multi-molecular HA complex for multi-depth hydration, low, medium and high-molecular-weight HA for superb hydration to rapidly penetrate and create a protective film on the skin surface, reduce water loss from the inside, 24 h moisturization, nourish the skin surface, repairs and restores from the inside and provides anti-pollution/anti-UV benefits. Tri-Peptide-1 encourages skin renewal and stimulates collagen synthesis in order to reduce wrinkles and sagging skin. Probiotics for stabilizing and creating a healthy skin barrier. Pomegranate extract provides anti-aging and moisturizing. Beet Root Extract for instant long-term moisture and supporting the natural moisturizing (NMF) factors. Shea Butter, Almond and Jojoba Oil, Allantoin, Vitamin E, B5 as well as polysaccharides for anti-inflammatory, smoothing, calming, soothing, softening, repairing, protecting and moisturizing properties. That’s an amazing ingredient list. I am super impressed! Overall, this multi tasker is one of my favorite product from them as a makeup base. 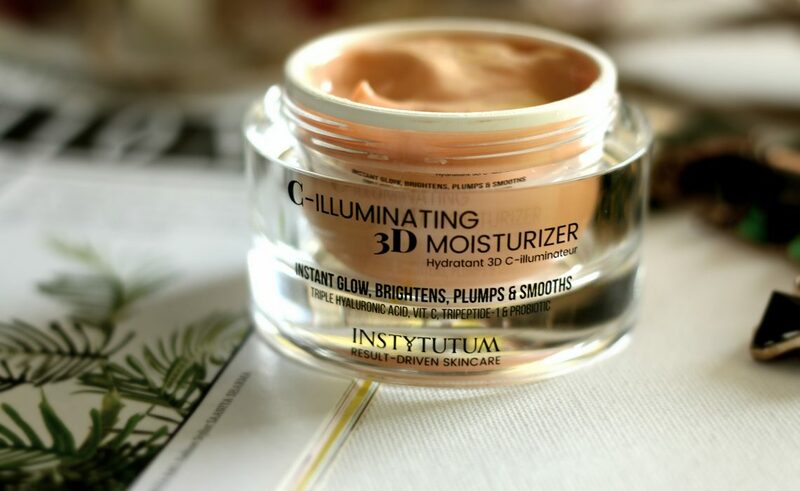 Instytutum C-Illuminating 3D Moisturizer instantly hydrates, brightens, plumps, calms, and smooth face providing a perfect canvas for your makeup. When used alone it gives a pearlized glow on the face and when used under makeup it gives a nice luminous effect. 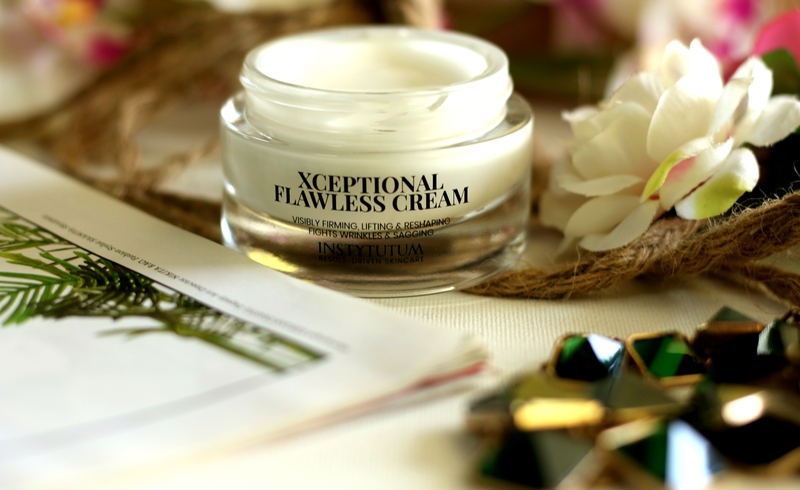 Instytyutum Xceptional Flawless Cream is a regenerating soothing formula, that fights free-radicals, advanced glycation, and reverse visible signs of photo-aging. 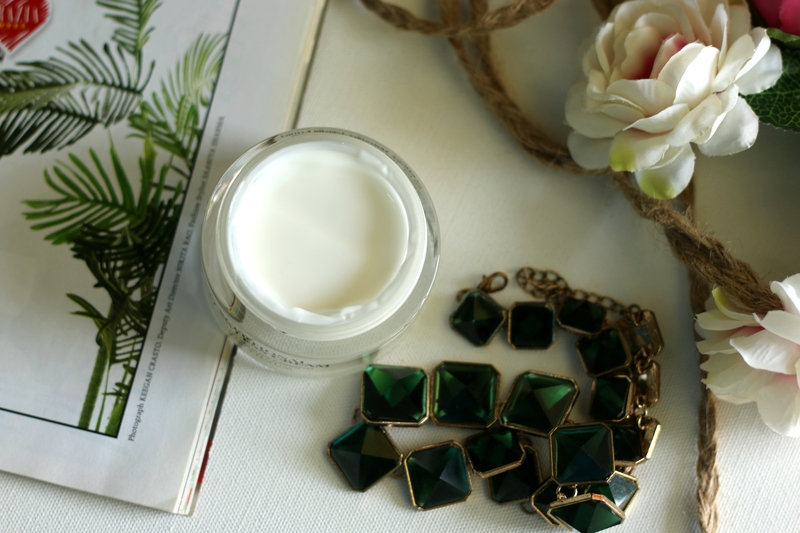 The texture of this cream is very light weight, with a pleasant fragrance and it melts luxuriously into the skin for a smooth and sensuous application. It’s supercharged with groundbreaking ingredients to provide multiple anti-aging benefits. Infusing the skin with a mega dose of moisture to increase plumpness, flexibility, and elasticity. 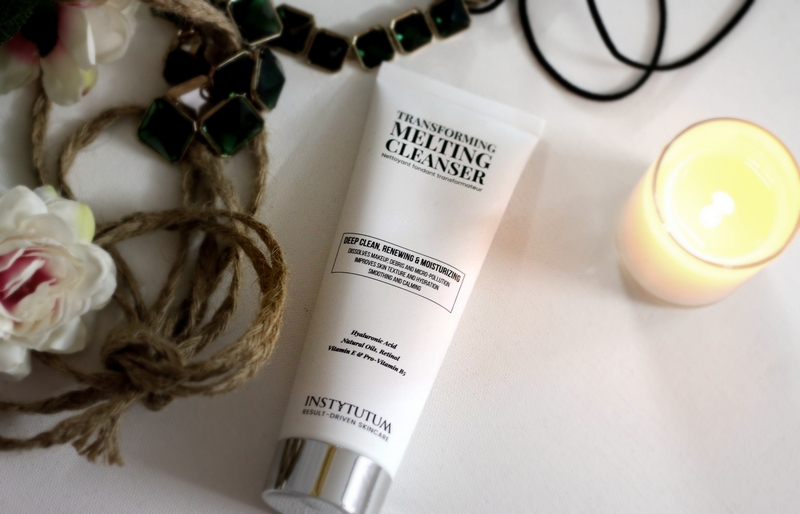 You can use this twice daily to clean skin to face, neck and décolleté. 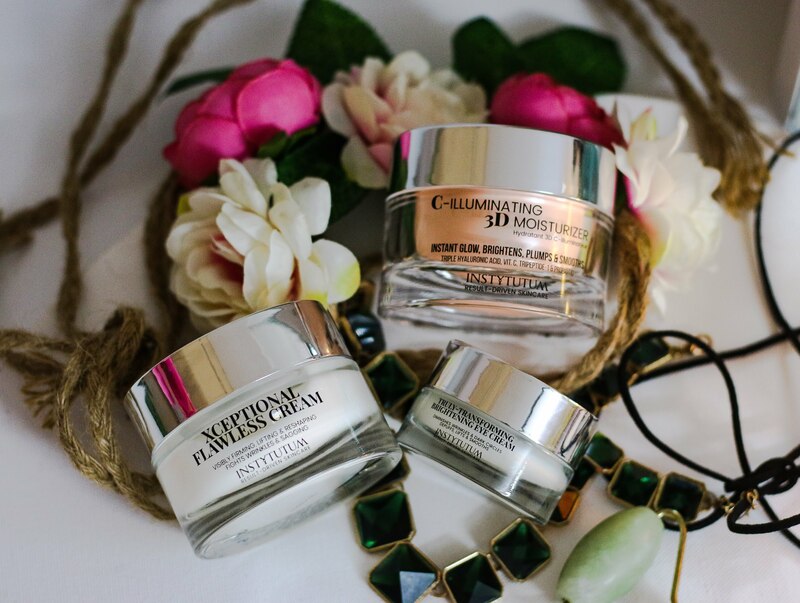 For best results apply after using Flawless Pads/glow toner and the Anti-Wrinkle Brightening C-Erum. It has the best impressive ingredient list that target all significant visible signs of aging. Infused with Raspberry stem cells and the Multi-Molecular HA complex to significantly improve the skins moisturizing capability and retain hyaluronic content to ensure flexibility, firmness and increased elasticity. Wild Tobacco stem cells and Coffea Cell Extract measurably reduce wrinkles, act as a potent antioxidant and improve cellular vitality. L-Carnitine to fight free-radicals, advanced glycation and stimulate the collagen synthesis. Tri-Peptides to rapidly reduce the appearance of fine lines and wrinkles, reverse visible signs of photo-aging, tighten and refine the skin texture while improving firmness and elasticity to lift and redefine the facial contours along the cheeks and jawline. Shrubby Everlasting Plant and Paracress Extract to regain firmness, tone and reinforce the architecture of the dermis to fight wrinkles and sagging. The contours of the face are strengthened and sculpted for a V-Shape effect. Vitamin E, Shea Butter, and Almond Oil as a perfect addition to smooth, sooth and deeply nourish and regenerate the skin. 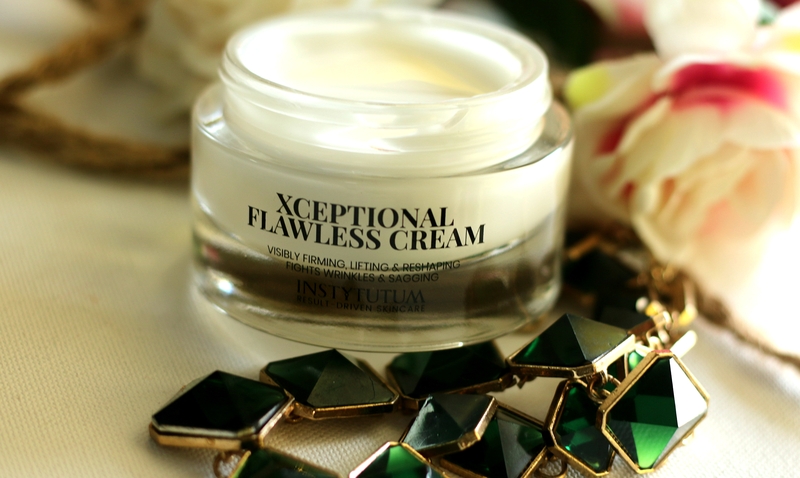 Overall, a perfect anti-aging cream. 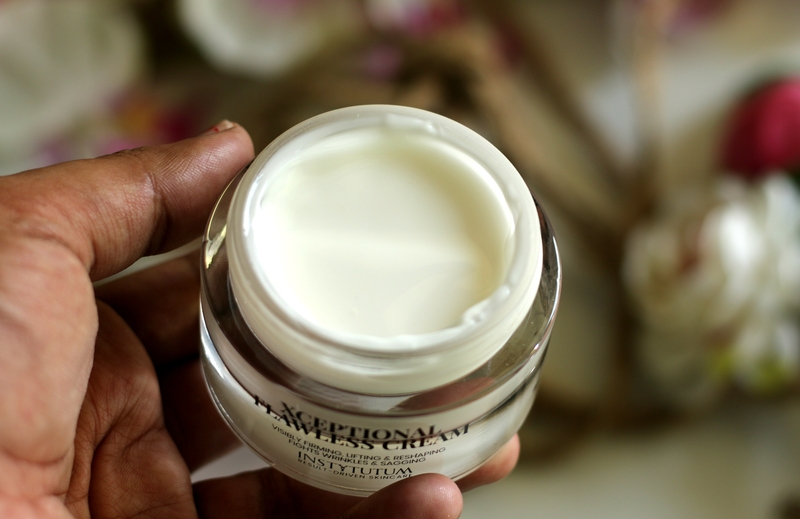 I am yet to experience the complete magic and skin transformation using this cream. It’s too early for me to tell the results. 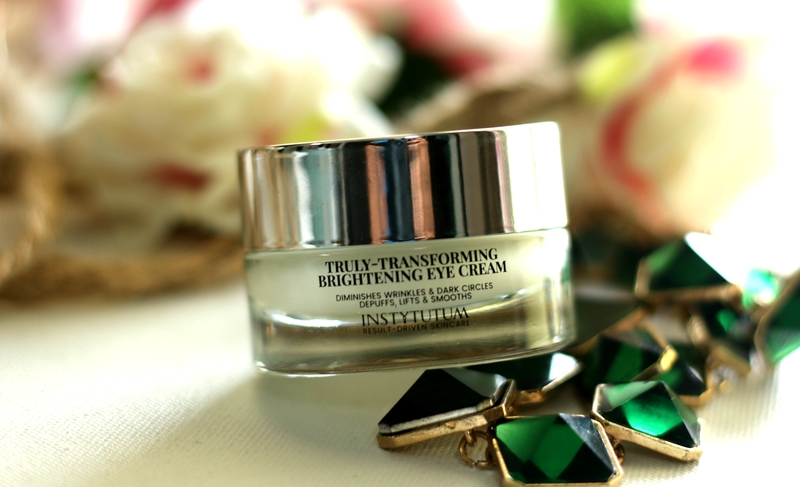 And, of course, I need to finish the Lifting Cream from Instytutum that I am using every day to enjoy this in full swing. Initial impressions are good. It’s light weight on skin. No breakouts or skin irritations or whatsoever. Definitely not greasy at all and also it comes with a bunch of anti-aging benefits and that’s a great yay factor for me as I am in my late twenties. I will do a separate post after testing the cream for about 4-6 weeks. 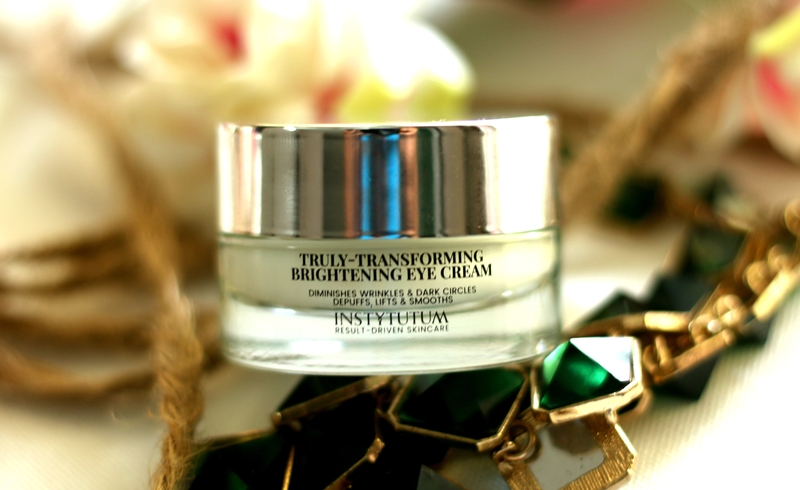 Instytutum Truly-Transforming Brightening Eye Cream is a rich, moisturizing eye cream to target signs of aging. You get ½ OZ/15 ML of product for $ 69.00. It comes in this tub packaging. It has a really rich formula which instantly sinks into the under eye area leaving the area soft, When you apply, you can feel that instant plump and smoothness. All thanks to the super ingredient – Multi-Molecular HA Complex and Raspberry Stem Cells for that multi-depth hydration, 24h moisturization. It improves the production of ceramides and reinforces the skin barrier and elasticity. Energizing Caffeine detoxifies, thus reducing water retention and puffiness.Silk Tree Bark Extract and St. Pauls Worth visibly lift the upper eye-lid. In combination with Ash Bark Extract, Vitamin PP, Coffea Cell Extract as well as Tripeptide-5, Biopolymers, calming Bisabolol and Shea Butter to brighten, tighten and reduce fine lines and crow‘s feet. It improves micro-circulation and reinforces the capillary structure to minimize under eyebags and dark circles to reveal a refreshed lifted smooth youthful eye area. I am using this every night and you really feel that lifted appearance of eye lids. I am yet to see any reduction on the dark circles that I have. 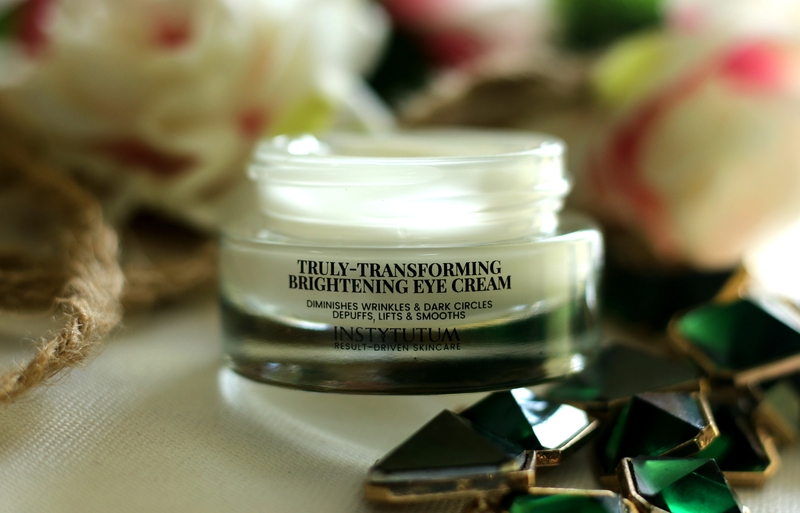 I like how easily this eye cream get absorbed to the area leaving the area plumped, hydrated and more radiant. After doing my night skincare routine. I like to cover my eye area using my favorite Silk Pillow Case and go to sleep. When I wake up, I notice my eye area appear more firmer and soft. 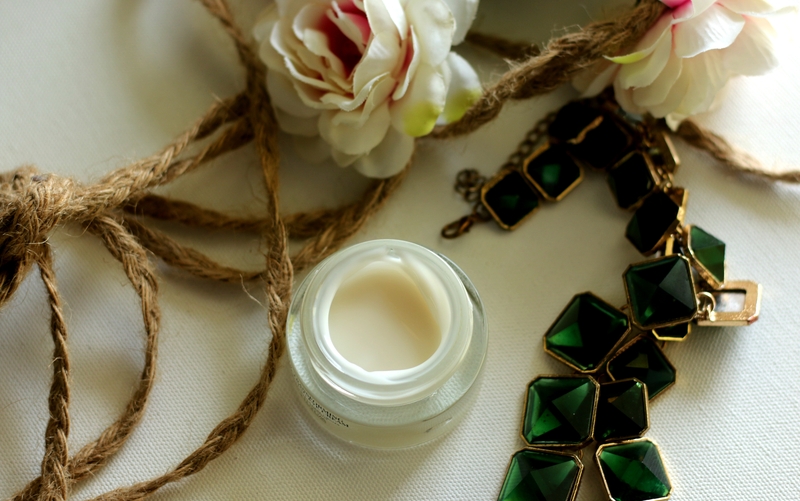 Overall, a rich and luxurious eye cream that tighten the under eye area. Eye lids give a lifted appearance and under eye area look more plump, supple and radiant. Formula is non greasy too. You get 5 SHEET MASKS for $69. 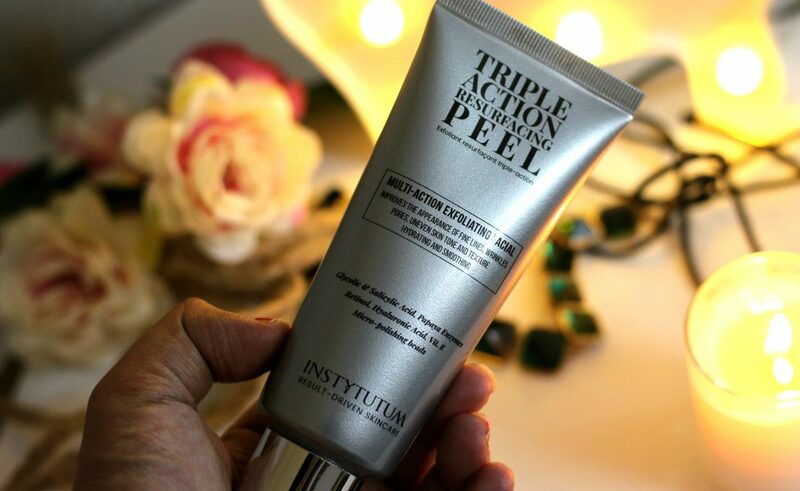 Use on cleansed dry skin, preferably after the Triple Action Resurfacing Peel. Unfold the mask and peel away the protective layers. Place 2 sheets on the upper and lower part of the face and adjust it to fit. Leave on 20 to 30 minutes. Remove the mask and massage remaining serum into the skin. I always think twice when I see expensive sheet masks, especially since these days, you get hydrating sheet masks for less than $1. For this price, I felt this was a little too much of claim. The price really amused me. Decided to give it a try. 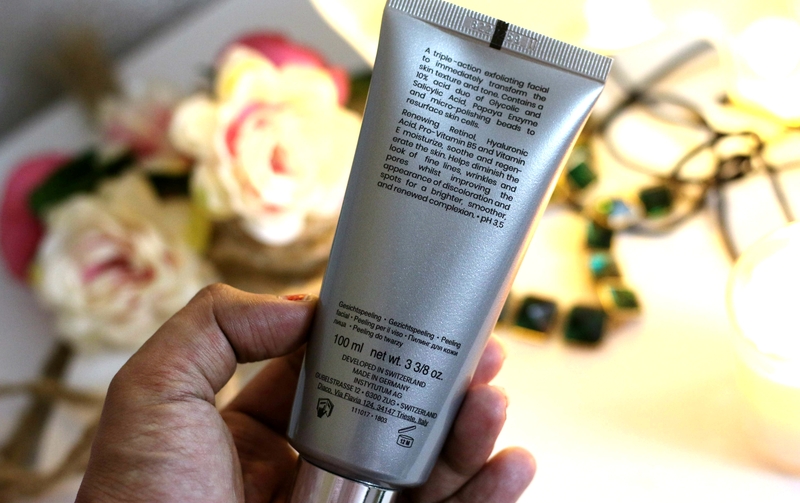 I did find out that it has some skin loving hydrating , brightening and anti aging ingredients. Also, I found that it’s a two piece mask made of hydrolyzed collagen for that better ingredient penetration and a better fit. It felt a lot like cellulose masks. Honestly, This one was hard to fit. It did slip on me several times when my face was upright. I ended up lying down so as the mask fits better and stays well. So, definitely not for you if you are looking for a mask that has all the above properties; But you are person who ‘d like to read a book or indulge in other activities when the mask is on. This one, as its slippery on face. One must always be lying down if it’s on. 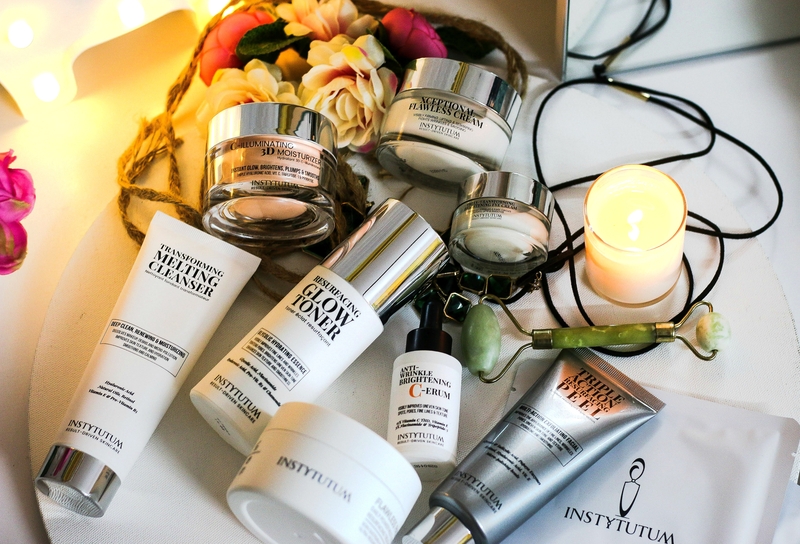 All Instytutum products are formulated with powerful cosmeceutical ingredients like Retinol, Peptides, Patented Stem Cells, Vitamin C, Glycolic Acid and more to improve overall skin texture and to firm the skin. Formulated without parabens, sulfates, mineral oil, and synthetic dyes. ** If you are pregnant, Check the product ingredients and take Doctor’s advice before using. Availability – INSTYTUTUM Official Site ; Ships Worldwide. 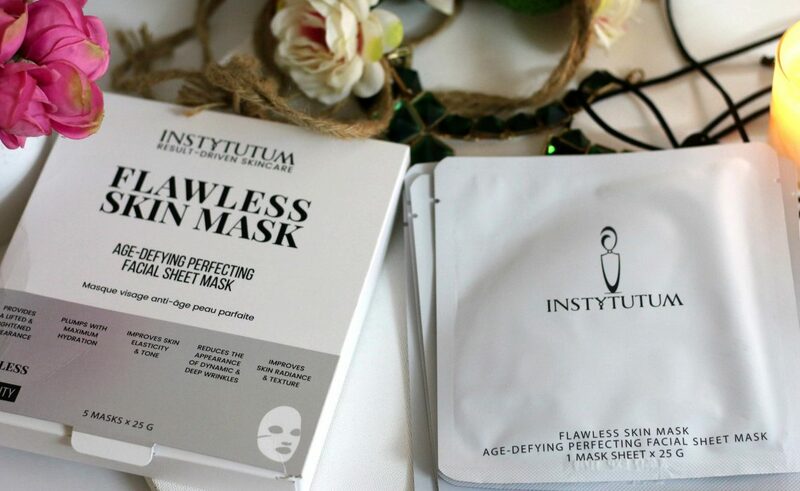 Have you tried any products from INSTYTUTUM ?